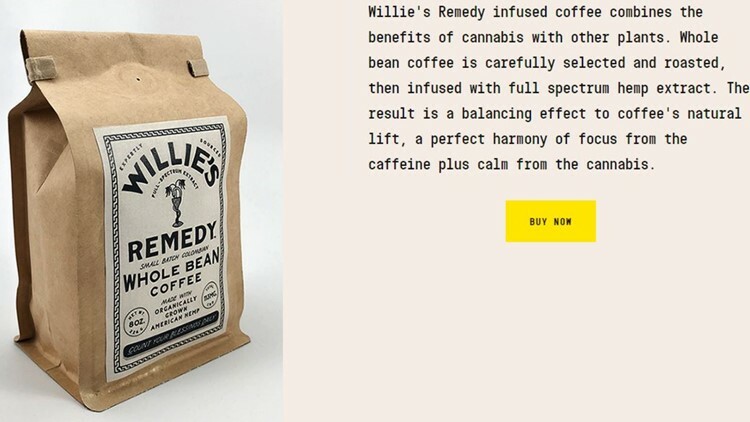 Willie's Remedy is a coffee with hemp-infused beans. Coffee perks you up. Marijuana has a mellowing effect. What happens when you mix the two? Willie Nelson, whose pro-marijuana position is the stuff of legend -- he claims to have lit up on the White House roof -- is launching Willie's Remedy, a coffee with hemp-infused beans. "Willie’s Remedy infused coffee combines the benefits of cannabis with other plants," the product's website says. "Whole bean coffee is carefully selected and roasted, then infused with full spectrum hemp extract. The result is a balancing effect to coffee’s natural lift, a perfect harmony of focus from the caffeine plus calm from the cannabis." The Denver Business Journal reports the coffee comes from Colombia, while the hemp is grown in Colorado, one of the states that has legalized recreational marijuana. An 8-ounce bag of Willie's Remedy sells for $36 online.